Enjoy the beauty and uniqueness of your special event for years to come with a live event or wedding painting by Meredith Piper. She will come paint live at your wedding, family reunion, city event, or any special occasion that you desire to have captured on canvas. On the day of your event, Meredith will arrive several hours before the event starts to set up and start painting in the background. As your guests arrive, she will be ready to add them into the painting. 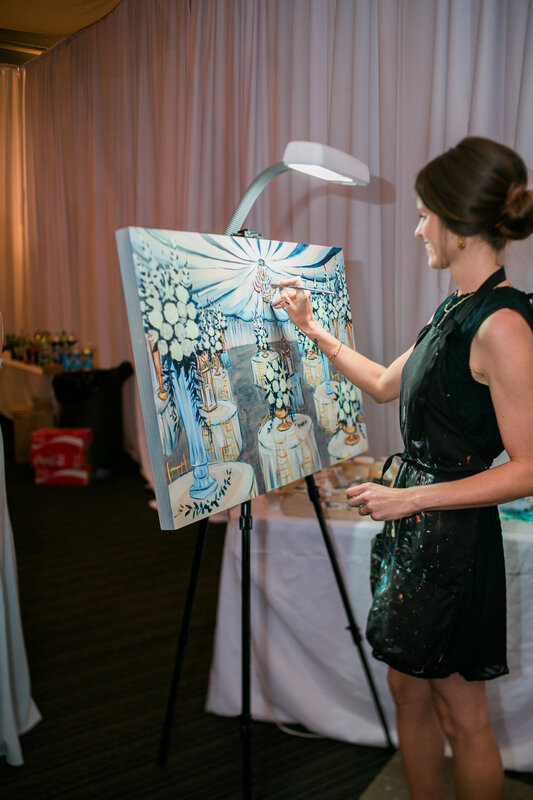 Meredith finishes most paintings on site by the end of your event, for you and your guest to enjoy. She uses thick gallery wrapped canvases, so framing is not necessary unless desired. Live event prices vary depending on canvas size, location, and duration of event. After the event, Meredith will put your finished painting on fineartamerica.com, where family and friends can order prints, note cards, and other variations of your original live painting. There is nothing quite like watching a painting unfold and then finding the likeness of yourself among the brush strokes. If there is a reason to celebrate, then it needs to be painted and remembered! Email Meredith to inquire about availability so you can have your own live painting to cherish for generations.